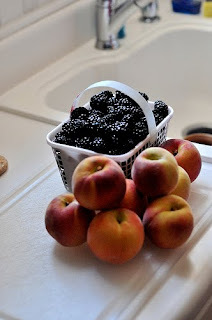 I wanted to share with you our trip to Gurosik's Berry Farm yesterday in North Augusta, SC. Anna and I went to pick blackberries and flowers only to find that the farm was at the end of the blackberry season. Luckily we were still able to buy a quart of huge, sweet blackberries that will find themselves in a cobbler tonight. We also bought shelled butter beans (lima beans to those of you beyond the Mason-Dixon line), peaches, home-grown tomatoes, and white acre peas (for Anna). How I missed going out to this farm all spring and summer, I don't know. But, you can be sure I will be back there next spring. They close for the year next week. I was excited to see the long rows of zinnias, gladiolas, and sunflowers. $2 a handful. We picked at least 5 handfuls. Aren't the colors wonderful? And, we filled up just about every vase I own! We have a fun evening planned. Steaks on the grill, potato salad, coleslaw, pasta salad, pickled okra sandwiches, and blackberry cobbler with hard sauce. Food is prominently featured for our July 4th celebration. If we can still move after supper, we'll head downtown to the Riverwalk for the fireworks display. Hope you all have a wonderful and safe July 4th! I love ZINNIAS. Great photos, Melinda. Thanks for sharing. I wish you could have been with us if you love zinnias as I do. I've never seen so many in one place. They were fabulous and I will be enjoying what we cut for several more days to come.